"The Windows Installer Service could not be accessed" is a frustrating error with many causes. I'll look at one trick that may clear a few of them up. The theory is that the Windows installer has become confused somehow by the previous installation. Perhaps that installation crashed, perhaps the installation was aborted, or perhaps it simply finished and failed to finish cleanly. Regardless, the Windows installer is in a confused state and unwilling to accept further installations. One approach to clearing the confusion is to, for lack of a better term, "whack it upside the head" by turning it off completely. Right-click on Computer or My Computer, click Manage, expand Services and applications, then click Services. In the list that appears to the right, scroll down until you see Windows Installer. Right-click on that and then click on Properties. The Startup type listed will be either manual or automatic. Change it to Disabled and click OK.
Repeat the steps above, but this time, change Startup type from Disabled to Manual. You do not need to reboot your computer here. Now, try installing something and see what happens. 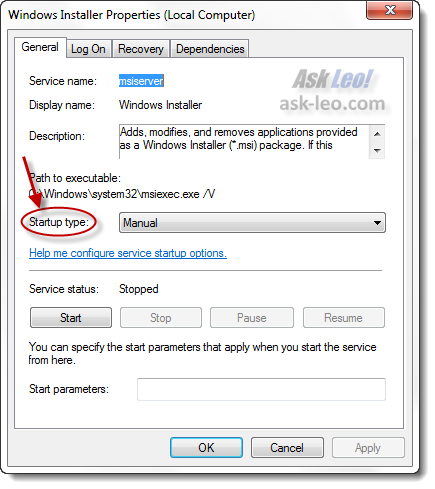 The theory is that forcing Windows to restart with the Windows installer service disabled causes some of the confusion about its state to be reset. And once reset, Windows installer can be used again. As I said, this may not fix every Windows installer "could not be accessed" problem, but it's a simple trick that can clear many confused situations. How do I install programs if I'm not the administrator of the computer? Many programs require that you be administrator in order to install. If you're not, you have few options. Most boil down to: be the administrator. Why does my computer say I need to be administrator, when I am? In Windows Vista and Windows 7, your account may be administrator but you still may be denied access, saying you need to be administrator. I'll show why and what to do. What do you think of the "Windows Installer Cleanup Utility"? I've been using it occasionally for years to fix the sort of problems described. Microsoft doesn't carry it any more but its available free of charge from other sources. I two found it useful, but Microsoft stopped carrying it because apparently it occasionally caused problems. The windows installer clean-up util, msicuu2.exe seems to be current with vista & 7. David C.
Apparently not. To quote the Microsoft website: "While the Windows Installer Cleanup utility resolved some installation problems, it sometimes damaged other components installed on the computer. Because of this, the tool has been removed from the Microsoft Download Center." I heard it was withdrawn because it occasionally has damaging effects, but it has worked for me in the past. I had this exact problem a few weeks ago and spent Daaaayyyyys with I.T. over the issue. Finally they were going to re-image my machine. windows installer needs to be re-registered. this re-registers your windows installer. I can,t believe that some people are still using Vista ! Dump it and move on~ download Ubuntu 11 for free and see your computer come alive. Thanks but i like add one more thing, you did not mention start service status option. This error can occur if the Windows Installer tool is damaged. 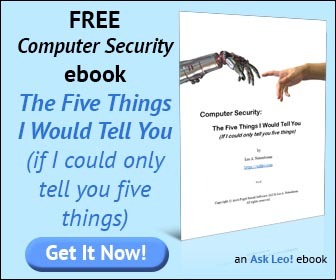 This was the second time in two years that I have experienced problems with Windows Installer and I am very pleased to find, again, the solution to my problems; many thanks Leo. I tried to use the method described above but I do not have the option to change the startup type. As I am the only user and the administrator, I do not know why. I had that problem, and tried Leo's solution. It worked, and it wasn't necessary in my case to reboot. So you might try and see if it works without rebooting first to save time. I don't have the option to switch it from manual to disabled, its grayed out and doesn't give me the option to click and change the setting.